Just a few days later came an entirely different message. Speaking about recruits to the priesthood, Pope Francis told priests to root out any gay men. In two statements, the pope managed to signal his pastoral support for LGBTQ people and uphold the Church’s staunch opposition to them. As a result, the argument within the Catholic Church about LGBTQ people is only getting louder and more fractious. On one side are the liberals, who are hopeful that Francis is nudging the Church to accept the modern world. “It sets a new foundation for Catholic teaching about sexual orientation that is very different than what has been traditionally stated,” said Marianne Duddy-Burke, the executive director of DignityUSA. On the other side are the conservatives, who are frantic to deny that his kind words mean a change in policy. So do Dolan and even more militant conservatives in the Church. Any wavering from the hard line set by Pope John Paul II and Pope Benedict is heresy. Literally. 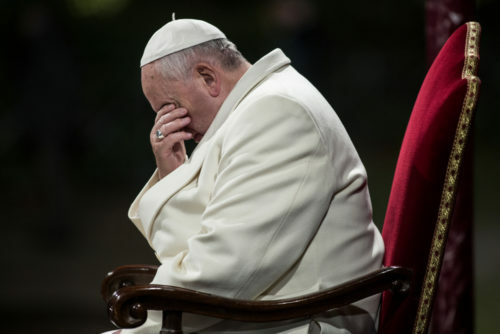 “This is a hinge moment in the history of Catholicism,” writes Ross Douthat, The New York Times columnist, in his book To Change the Church: Pope Francis and the Future of Catholicism. Douthat slams Francis for his failure of orthodoxy on a range of issues, include LGBTQ ones, arguing that the pope is putting the future of the Church at risk by caving into temporal pressures. Led by Cardinal Raymond Burke, a group of cardinals has been directly challenging the pope’s leadership. Burke has gone so far as to say that there are times when a “Pope must, as a duty, be disobeyed”. Of course, the conservatives had the upper hand for decades, and Francis is diminishing their power. (He removed Burke from his position at the Vatican, a pointed demotion.) But from his perspective, the pope is only changing tone, not substance. But it’s that last sentence that should give the liberals pause–and conservatives hope. By expressing a willingness to accept gay people for who they are, Francis is trying to heal the wounds that the Church has caused. But that means when the wounds are healed, the lectures on your spiritual health can begin. The problem is that the orthodoxy is what caused the wounds in the first place. And no amount of verbal acceptance will ever overcome the policy of condemnation that Francis shows no signs of ever wanting to change.